I had a great day at A Craft Affair on Sunday. Although I was still rushing at the last minute, I was much calmer than for my first market, Craft 2.0 a year ago. I did manage to finish my new product, starfish baby rattles, but have yet to upload them to Felt. They were literally brand new, I finished stuffing them at midnight, and sewed them up in the morning. My new soy tin candles went down a treat, and I sold out of the Mandarin & Mimosa fragranced ones. I met some lovely sellers from other parts of New Zealand that I knew 'virtually'. It was nice to put faces to blogs and felt shopnames, as well as getting to know some local crafters a little better. As usual, it was rather busy, so I didn't get a chance to look around the whole building. Emma from Freedom Creative kindly watched my stall for me while I did a quick tour of the top floor. 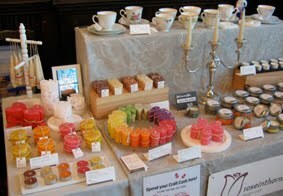 I only got photos of my stall, so to see the whole fair, take a look at the A Craft Affair blog. Lucy has been putting up a virtual tour of the fair. Maddie from lilmagoolie blog has written a great overview, and you can read some great writeups from other sellers – Songbird Designs, Relique Vintage Jewellery, little minx, Black Swan Designs and Miss Millie. Finally a huge thanks to Lucy for doing such a wonderful job organising A Craft Affair. Yet again, you've done a fantastic job! Sue – Thanks! Now I just have to figure out how to condense it back down to half a stall when I take it on the road, like in Auckland next week! Jac-ber Creations – Yes, it was a great day!